The Taiwanese bubble tea craze has finally arrived in State College at Tea Time, located downstairs from its adjoining Chinese restaurant Little Food Court at 250 East Calder Way. The milk- or fruit-based tea beverage gained popularity because of the fun and chewy texture of the sweet tapioca balls that float to the bottom of the drink. These tapioca “boba” balls come in a variety of flavors that burst in your mouth as you sip this creamy tea beverage through a wide straw. Typically made with black or green tea, customers can mix and match ingredients to create one-of-a-kind beverages, depending on their choice of milk, fruit, or Calpis (yogurt) bases along with the different flavored tapioca balls. There are more than three dozen combinations at Tea Time to try, including the Lychee Calpis, Acai Berry Calpis, Mango Green Tea, and Passion Fruit Green Tea. Sharon Ngan, owner of Tea Time and Little Food Court, also owns Little Szechuan, an authentic Szechuan restaurant at 228 West College Avenue, serving bold flavors from southwestern China. Ngan took over the East Calder Way location in December 2017 and it has gradually undergone a series of renovations during the various Penn State semester breaks. Reopening in January 2018, its popularity quickly drew crowds during the lunch rush, where they typically serve more than 200 diners in three hours. For less than $8, diners can choose three menu items from more than 20 hot dishes, one soup from a choice of two to three made fresh daily, noodles or rice, and a soda. Frequent diners can also purchase a lunch card for $75, which can be used 10 times at Little Food Court to get one free lunch. Speciality lunch items include braised pork belly, chicken quarter in hot oil, and seaweed with egg drop soup. Open for lunch and dinner Sunday through Thursday from 11:30 a.m. to 9 p.m. and Friday and Saturday from 11:30 a.m. to 9:30 p.m., Little Food Court also serves made-to-order menu items after 4 p.m. Grilled meat skewers and customizable stir-fry hot pots are also available for dinner after 4 p.m. The stir-fry hot pots are popular because diners are able to pick different ingredients from the cold bar as well as adjust the level of spiciness; prices are by weight. In the coming months, more renovations are planned, and new dessert items will be added to accompany Tea Time’s bubble teas. 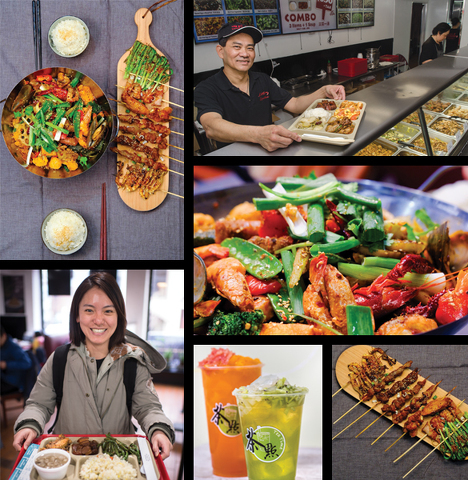 “We would like locals to check us out for dinner because we have plenty of parking behind the building, a large dining area serving a variety of Chinese dishes in addition to our grilled skewers, stir-fry hot pots, and bubble teas,” says Ngan. Delivery and take-out are available through GrubHub and other food ordering apps such as RICEPO. For more information, call Little Food Court at (814) 826-2189. Mention the Town&Gown article to get a free medium-sized bubble tea at Tea Time with $15 food purchase at Little Food Court. Vilma Shu is an editorial consultant for Town&Gown.